Fast forward two years, and they release an apparently “low key” single, produced by hitmaker Calvin Harris, which gets Radio 1 playlisted, but still only makes number 28 in the charts. 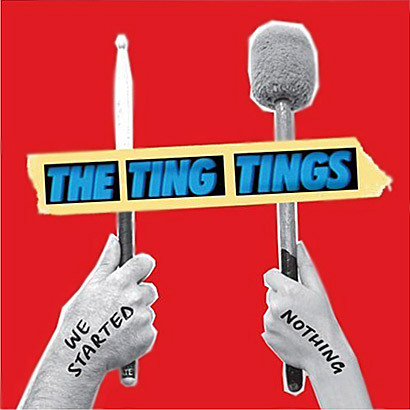 The Ting Tings were apparently annoyed, and deleted all the things they were working on, things the record company were apparently quite keen on. So they started again, and it has taken till now for us to see the fruits of their labour. Time will tell whether it makes or breaks them, but their oddly contrarian attitude in interviews – not interested in making “hits” anymore, deleting songs the record company liked, taking four years to follow up a hit album, is threatening to overshadow the actual thing they are putting out. So to recap – a well liked début album that was critically and commerically supported, odd unpunky attitudes to licensing their music (the aforementioned iPod advert, their work has also hawked Fanta, and appeared on film soundtracks), punky attitudes to their record label, confusion over whether they are a “pop” band or an “indie” band (a debate which “raged” in 2008, in a similar way to the issue Lana Del Ray is facing now about apparent authenticity) all comes together to make me ask the question – are The Ting Tings the perfect manifestation of the confused nature of being in a band at the moment? That isn’t to say they are the best – although their previous singles had charm, you would be hard pushed to call We Started Nothing a classic, but in their bizarrly confused attitude and appearance, they appear to reflect a growing confusion, from both the press and public about what exactly is important – authenticity? not “selling out”? (in an age when it is harder for artists to find monkeymaking outlets, that one could be trickier) pop? indie? What does it all mean, and does it matter? They also of course, like any respectable modern band have a girl fronting them – boy frontmen are so 2003. It will be interesting to see what album number 2 wields – I suspect they will have to avoid the ubiquity of 2008, but will the “cool” crowd take them back now?